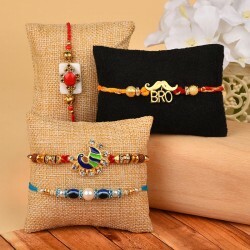 Order set of 4 beautiful rakhis for your brothers and add even more joy to the occasion of Raksha Bandhan. 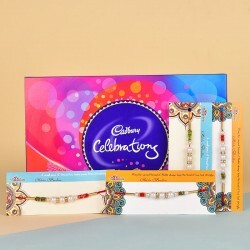 WIth us, you get to surprise them with the perfect designer rakhis that vary from a little traditional ones to contemporary. Make your choice and send them across. Raksha Bandhan is that one time when we get to reconnect with our siblings. Our Brothers and Sisters are the ones with whom we create some beautiful memories. They are our childhood buddies. Through the festival of Raksha Bandhan, we get show our love to our siblings. If you are a proud sister of four loving Brothers and you are looking for some beautiful Rakhis for them, then, MyFlowerTree has some amazing set of 4 Rakhis for you. 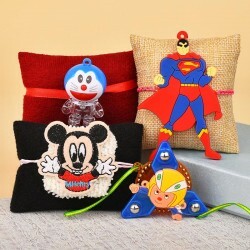 With us, you get to choose best rakhi gifts for your every younger and elder brother and make them smile even wider when they receive it at their doorstep. Every sister wants nothing less than the best Rakhi to tie on the wrist of her Brother, for this one Rakhi, she goes everywhere. With MyFlowerTree, you don't even need to step out of your home. 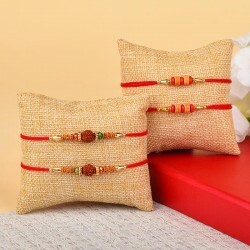 We have amazing fancy Rakhis for this amazing festival. It includes an exquisite collection of Silver Rakhis, Kundan Rakhi, Pearl Rakhis, Bracelet Rakhis, Traditional Rakhis, Lumba sets and more. You can buy these Rakhis as a single item or in the set of 2, 3, 4 and 5. 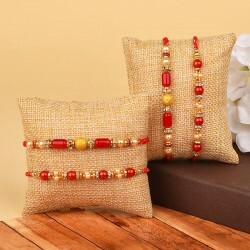 All the Rakhis are beautiful and will make this day amazing. Only sending Rakhi to the Brother will not work on this Raksha Bandhan. Take an extra step and send a special Raksha Bandhan Gift to him. He is going to love you even more. At MyFlowerTree, you will find the best Raksha Bandhan Gifts including beautiful Flowers, Delicious Cakes, smooth chocolates special Mugs and Cushion, personal grooming items and more. 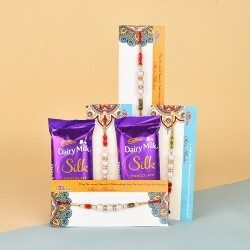 If you wish to send a personal message to your Brother along with a Rakhi, you can do so if you by sending a Greeting Card along This way, you will be able to express your feeling for him. 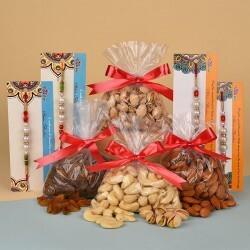 If you love to follow the traditions you can Send Rakhi with Dry Fruits. We have special Thalis of Almonds, Cashew nuts, Pistachios, Walnuts and Raisins. You can also Rakhi with sweets to your Brother. We have all-time favourite sweets like Kesari Petha, Kaju Katli, Rasgulla, Rasberi, Soan Halwa, Gulab Jamun, Gandheri, and more just for the Brothers. On this Raksha Bandhan, send Rakhi Online to your Brother with MyFlowerTree With us, you can send Rakhi to Haryana, Gujarat Chennai, Delhi, Puducherry, Kerala, Punjab, Rajasthan, Delhi, Mumbai, Assam, and everywhere else. 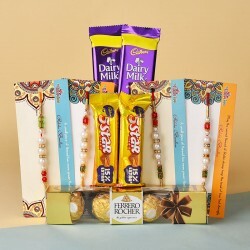 If you wish to send a Rakhi abroad, even that is a possibility with MyFlowerTree. 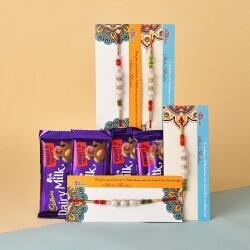 We cover many international locations for online delivery of rakhis including Australia, Canada, US, UAE, Qatar, South Africa, Malaysia, France, Sweden, UK, Singapore, among a few more. 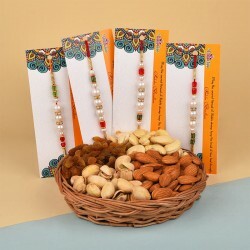 Book a set of 4 rakhis online with us and send it anywhere in India or abroad.